This type of high-floor bus, used by the transit industry for more than 100 years, required bus patrons to negotiate steps before boarding. Today’s Metro buses feature low-floor designs for faster, easier boardings and alightings. 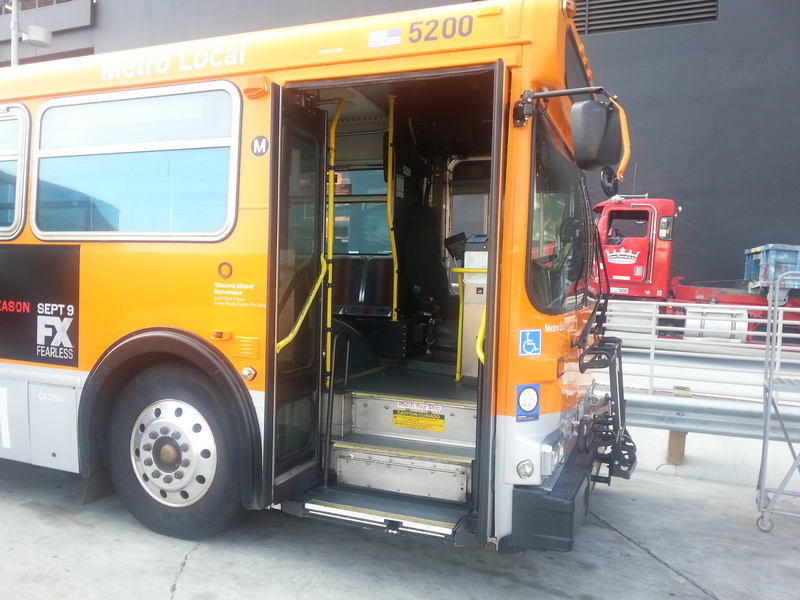 Bus riders in Los Angeles County will no longer have to climb stairs to board a Metro Bus on any of Metro’s 170 bus lines beginning August 30. That’s the date when Metro will be officially retiring its very last high-floor transit buses and replacing them with “low-floor” buses. That’s a notable milestone in the history of local transit. High-floor buses were employed by transit operators since the inception of motorized transit buses and Metro, as well as its predecessor agencies, have operated high-floor buses for decades. Climbing steps to board a bus has been the common experience of multiple generations of bus riders. High-floor buses were originally designed to accommodate fuel tanks, air tanks and other mechanical equipment that was located under the cabin floor. But this simple design had its limitations. It made it more challenging for some bus riders, including the elderly and those with physical disabilities, to climb aboard. The stairs ruled out public transit for passengers using wheelchairs altogether before the 1980s, when buses began being retrofitted with wheelchair lifts. But the high floor, coupled with complicated and sometimes troublesome wheelchair lifts, created ongoing challenges for people using wheelchairs. The number of patrons who use wheelchairs on Metro buses continues to grow, helping spur needed accessibility improvements. Metro’s latest figures for July 2014, for example, show more than 2,800 customers who use wheelchairs boarded Metro buses every day. There were more than 88,000 wheelchair boardings for the entire month. Transit bus technology has continued to mature. In the 1990s, for instance, Metro began the transition from diesel-fueled buses to those fueled with compressed natural gas and liquefied natural gas. Fuel tanks for these gaseous fuels weigh far less than their liquid fuel predecessors. That made it possible to place fuel tanks and other mechanical equipment on the roof of the bus, in turn also making it feasible to lower the cabin floor and eliminate the need for steps altogether. While liquefied natural gas buses were ultimately discontinued, Metro now operates the largest fleet of compressed natural gas buses in the nation, all of which employ a low-floor design. These new buses with the latest accessibility technology have wider ramps and entry doors, as well as wider space at the fare box for better maneuvering for customers who use wheelchairs or other mobility devices or aids. 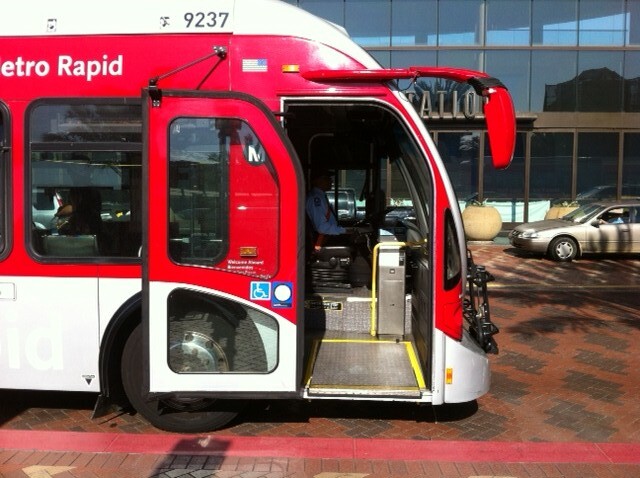 The ramps are also less mechanically complex, and can be deployed easier and more quickly, a key improvement that speeds boarding and exiting times for everyone who rides Metro buses. SO…when and where is the last run High Floor bus run party and media event? And will the last such bus be saved for an historic bus fleet? There’s not. 5200 which is was the last High Floor remaining had it’s last run 2weeks ago. Now it sits at Division 7 waiting to be towed and sold at Auction. So that mean the new flyer buses that are new they will take there place..
Will high floor busses also be phased out on contract routes, or is this only Metro-run routes? Well, there are/were no high floor buses at the contracted routes these past few years. All the high floor buses were at Metro. Im a wheelchair user who uses the metro on a daily bases. If something could be done about the two wheelchairs per bus situation would be great. Its a real inconvenience waiting for whatever time you waited and then get told you cant get on because there is already two chairs on board. Especially when one is in a hurry this is a huge problem. Why not keep the old buses around like Foothill Transit? The old buses can be used for drivers and law enforcement training, bus rodeos, bus bridges, and security barriers when Obama is in town. Will Metro regrets when it catches the “perfect storm” and need more buses for emergency situations? Sure would’ve been nice that Metro hadn’t wasted $1.2 million dollars in taxpayer money to buy a mobile “command center” home when they could’ve just as easily converted one of their old, retiring buses for much cheaper cost. The mobile command center was funded by a federal grant, I believe. What difference does it make that it comes from a federal grant? In the end, it’s the same source: tax dollars. $1.2 million in taxpayer money that could’ve been better spent elsewhere like schools. Did Metro really need an overpriced toy? Did they have any problems without a mobile home before? No. The issue with grants is that they typically can only be spent on certain things. Nevermind the logic that nothing is free in this world and it actually comes from tax dollars and that no taxpayer input was provided on how to use the grant. Whatever the source of money is and whatever the intent was, there’s no excuse for Metro to waste people’s tax dollars into a $1.2 million dollar mobile home, without the people’s consent. Metro didn’t have this toy during the LA Riots or the Northridge Earthquake and they managed to get by fine without it. And that was before we had all these computer technology that exists today. It came from a security grant? Then a better use of $1.2 million dollars would’ve been to buy more fare gates or upgrade the some of the stations to accommodate gates. That’s a security issue right there! Using technology to minimize fare evasion and prevention of criminals from entering the system to begin with. That’s what people would say if they had a voice in said matters on how to use federal TAXPAYER FUNDED grants. I didn’t say “free” — you made that up. I briefly explained the issue involving the funding of the mobile command center, which has absolutely nothing to do with the low-floor and high-floor buses. But you tied the two issues together — alleging an old bus could be converted (presumably at some cost) in order to appear to have something to say and leave yet another comment on the blog. I’m all for a variety of opinions on the blog’s comment board, but I’m also not going to allow uninformed trolling and bullying. Cheaper, maybe, but I don’t know about “much cheaper.” The bulk of the cost of a mobile command center is the equipment that makes it a mobile command center. It would require a lot more electrical power than a transit bus, so those systems would also have to be upgraded. And in the end, you would still be left with a 15 year old vehicle with hundreds of thousands of miles on it that is going to require more maintenance and not last as long as a new vehicle. Plus it’s a model that ended production 15 years ago, making parts that much harder to come by. Wow….i thought i’d never see the day when this would happen. I was really sad when all the diesel engines were eliminated. I was sadder when all the RTS TMC and Grumman’s were retired. I’ll have to make a trip out towards South LA in the next 3 days to take pictures. I currently live in the San Fernando Valley and there hasn’t been buses with steps out here in years. Here, here save the old buses for an emergency like the next big earthquake. What you get from auctioning them may not even be enough to cover a year of “The Chief’s” pension. but the old buses are like “money in the bank” incase of the “perfect storm”. Mothballing old buses still requires storage space and maintenance, which is a significant cost for a “just in case” situation. In past major disasters or events that required a lot of buses, they were simply borrowed from other agencies. Because the majority of the monies used to purchase new buses comes from the Feds. the MTA can not keep these old buses. The Feds do not provide funds to increase fleets but only to replace old buses usually. Ivan, Metro has a fleet of buses for just such emergencies. Like most agencies it has a spare fleet that is 20% of what the peak fleet is. METRO not listen to the public? I am “shocked, shocked” to read that! So let’s turn the richest agency in the LA Basin into an ELECTED body…instead of one filled with political appointees. Does anyone know the process to take our METRO back from the professional political drones? You should consider gathering actual facts before posting. Twelve of the 13 Metro Board Members are elected officials. Everyone in Los Angeles County gets to vote for a county supervisor — all supervisors are on Metro Board. The other Board Members are the mayor of Los Angeles and his three appointees (which includes two members of the elected City Council), and currently elected officials from Lawndale, Glendale, Santa Monica and Duarte. You may not get to directly elect Metro Board Members, but they are elected officials. The fact that you don’t know this or could bother to type this demonstrates that you are trolling and will say anything, but not really commenting. Also, your comment has nothing to do with the issue of high-floor and low-floor buses. But that’s hardly a surprise. “I’m Sorry Steve you can’t do that”: expressing as fact a negative personal opinion of my character and professionalism and broadcast same via a public forum. I am of the opinion that I have been slandered and will consider my options. Any critique of any METRO action such as keeping or dumping old buses can rightfully be placed at the feet of the METRO Board because it ultimately answers to the public on all METRO matters. I am informed on the U. S. Constitution, and an elected official democratically serving in one public agency, is not automatically serving democratically in another public agency if appointed, not elected–in spirit, if not in law. What I may have not done is clarify for your readers that METRO’s board should be elected directly by the public from the general pool of the citizens and not appointed from a pool of already serving politicians. The former more serves democracy and the later smacks seriously of oligarchy, especially since METRO, budget-wise, is the premier public agency. You left a comment alleging the Metro Board was made up of political appointees and I corrected/clarified what you said. Metro is also, by far from being the “richest” agency in the LA Basin. It costs a billion dollars to run Metro each year, but with one of lowest farebox recovery ratios in the US, let alone the world, more than 72% of Metro operations have to funded through taxpayers. I have lived in Cincinnati (Queen City Metro), Columbus (COTA), Chicago (CTA/RTA), and Orange County (OCTA), and LAMTA is my favorite transit agency so far. However, the low farebox recovery rate may be Metro’s own fault. What is to be expected with honor system which still operates on much of Metrorail (in practice, if not in theory)? Also, I don’t know how many time seen have seen riders (stowaways, actually) enter via a rear exit on a crowded rapid bus. Just wanted to note changing the composition of the Metro Board would entail passing legislation and having it signed by the Governor. The last attempt at this earlier this work wilted very quickly. Chasing that idea probably is going to end in frustration. Thank you for your polite reply and details. Yes it would be difficult to more “democratize” METRO’s BOARD, but so is extending the 710 freeway to the 210 by any means. But, METRO/CalTrans & cie continue to pursue it after 50 years. Rome was not built in a day; nor did it fall in a day. And the last attempt to extend the Purple Line out to the sea was derailed thanks to Congressman Henry Waxman. Now everyone is saying the subway to the sea should’ve been done 20 years ago. Politics and ideas change over time. Converting a old bus into a Command Center was tried at least once before , maybe more than once, and it didn’t work out. I know from experience communication was unrealible and that was with the prior radio system. The MTA does not use the simple two way radio system. It’s a complex system that enables not only individual communication with each bus but collects data on the operation of each bus continually including it’s exact location. The easiest way to put these high floor buses in good use is to remove all the seats stuff them with toys for the Christmas toy drives. It is a waste resource to use the 60-footers for toy drive events. Wait tell next year. They will probably be used for such special events as the Hollywood Bowl. The priviate contractors buy up our old buses when ever possible.